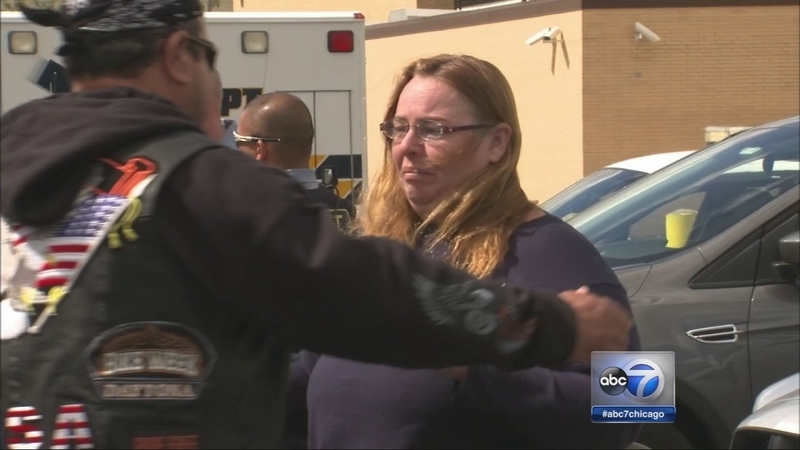 FOX LAKE, Ill. (WLS) -- Melodie Gliniewicz, the widow of disgraced Fox Lake Police Lt. Joe Gliniewicz, will receive $33,500 from a bank account frozen as part of an investigation into her late husband's alleged embezzlement. Lake County Assistant State's Attorney Ken LaRue said Monday the sum consists of a paycheck and donations received after Lt. Gliniewicz's Sept. 1 death. Those donations are not under investigation. Melodie Gliniewicz's attorneys claimed she couldn't pay her mortgage, medical bills, or family expenses. Last month, both parties agreed to release $4,187 to the widow. Her lawyers released a statement Monday that said she and her family are thankful that the Lake County state's attorney's office agreed to release the funds and would cooperate with the ongoing investigation. They do not plan to make any further comment on the case. Lt. Gliniewicz is accused of embezzling thousands of dollars from a police youth program to pay for adult websites, gym memberships and family vacations. Gliniewicz staged his own suicide to look like a murder - prompting a major investigation and manhunt - in an attempt to hide the theft, authorities said. Melodie Gliniewicz is also under investigation. She has not been charged and denies any wrongdoing.